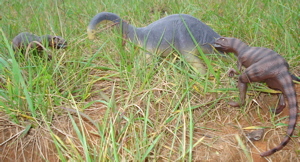 The Schleich Allosaurus has an awful lot of personality. 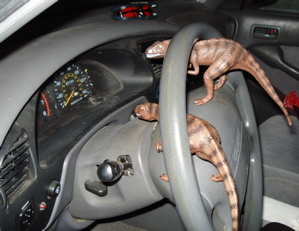 The Schleich Allosaurus Dinosaur Toys are Very... "Playful"
The Schleich Allosaurus came out in 2001 but wasn't until late 2008 that I got my first and a few weeks ago my second. 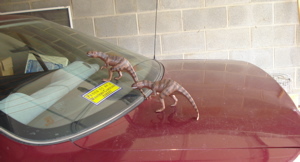 Now that first Allosaur was pretty tame seeming. 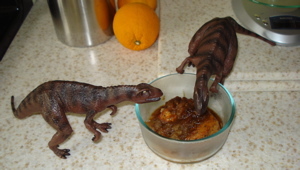 He would quietly join with other Allosaurs on a hunt but, generally, behave in a reserved manner. But as soon as I got that second one... The "Trouble Twins" were loose. 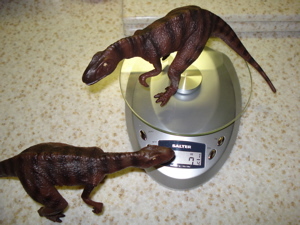 Weighing in at a svelte seven and a quarter ounces (7.25 oz) and measuring one foot (12") from snout to tail tip this great looking Allosaur is ready for action. It is made of soft rubber which makes it rugged (and safe) while it is also hand-painted which makes each one an individual. The paint itself wears well. 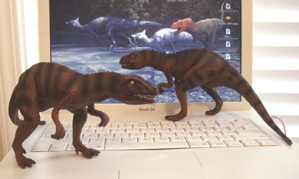 You really can't see much difference between my brand-new Schleich Allosaurus and my year-old one. The bright eyes and teeth show up beautifully and give these what I see as a mischievous (perhaps more of a "lean and hungry") look. 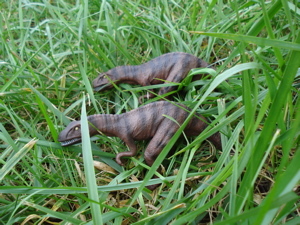 Now what might a pair of Schleich Allosaurus do to pass the day? Checking the news and seeing what the relatives are up to can really stimulate the appetite. 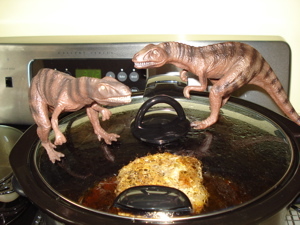 So our twin Schleich Allosaurus head into the kitchen where they find the meal is still being prepared. Stealth is called for when one (or two) is preparing to rumble in the jungle. and rejoining proves somewhat more successful. 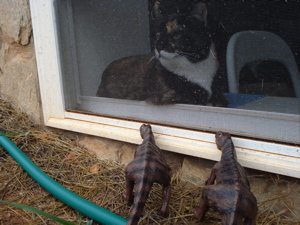 our intrepid hunters are relieved to see that their biggest competitor is safely behind bars. 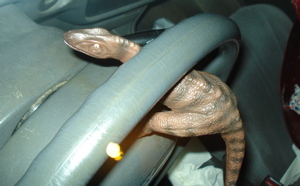 "Getting into this will be cinch..."
"uhhh...How do you start this thing?" "I think I need a steering committee." 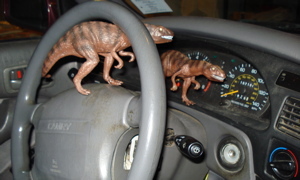 "I'm shifting as fast as I can!" "Oh, officer. I left my wallet upstairs. 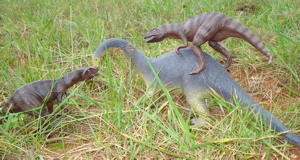 How about wait here with my brother while I go get it..."
The Schleich Allosaurus has surprised me with its versatility and adaptability to many different play situations, both indoors and out. They have great expressiveness and the adaptability to find themselves (being placed) in all manner of situations. 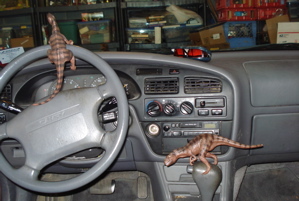 These are terrific Dinosaur toys. 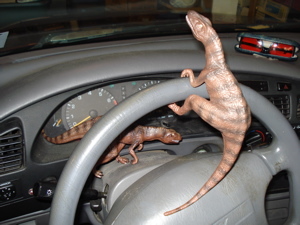 It is still in production and can be found at "better" retail outlets and on eBay for ~$12-14.00. It's definitely worth a pick-up. 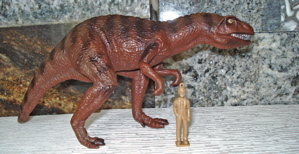 Brand-new he comes with a little plastic statuette- the one I use as ME- which can serve very well when hunting is poor. And a little information "booklet" in German, English, French, Spanish & Italian. 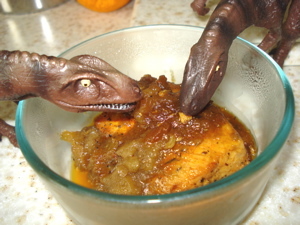 If your interest runs to Dinosaurs that the Allosaurus liked to eat, such as Stegosaurs and Apatosaurs, they too can be found right near by. 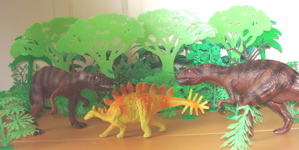 And the Dinosaur Toys Collectors Guide Home Page is never far off.